Editor’s note: Elad Gil is a serial entrepreneur, operating executive, and investor/adviser to startups. He is an investor in Airbnb, Pinterest, Square, and Stripe. Elad was co-founder and CEO of MixerLabs which was acquired by Twitter he served as the Vice President of Corporate Strategy. Prior to Twitter, Elad started Google’s mobile team and was the first product manager on Google Mobile Maps, Mobile Gmail and other products. Elad recently co-founded a new genomics software company. Follow him on his blog and on Twitter @eladgil. 1. Overconfidence. As the disruptive companies emerge, the incumbents view the new entrants as specialized toys that could never threaten their decades-old franchise. This is the time for the incumbents to take action and innovate, but instead they usually ignore the new entrants, or often try to delay them with regulatory actions, such as forcing UberCab to change its name to Uber. Uber and Lyft’s early skirmishes with regulatory bodies are good examples of this standard tactic. Similarly, Airbnb has been pursued by the hotel lobbyists in NYC. 2. Sudden collapse/downward spiral. Sudden realization that things have changed. Realization is typically sparked in the incumbent through a drastic turn of events – e.g. the incumbent unexpectedly misses a quarter in a big way when its business evaporates faster than anticipated. A sharp collapse in its business is often the singular signal that the industry has hit a tipping point and an irreversible downward spiral kicks in for the incumbent’s business. 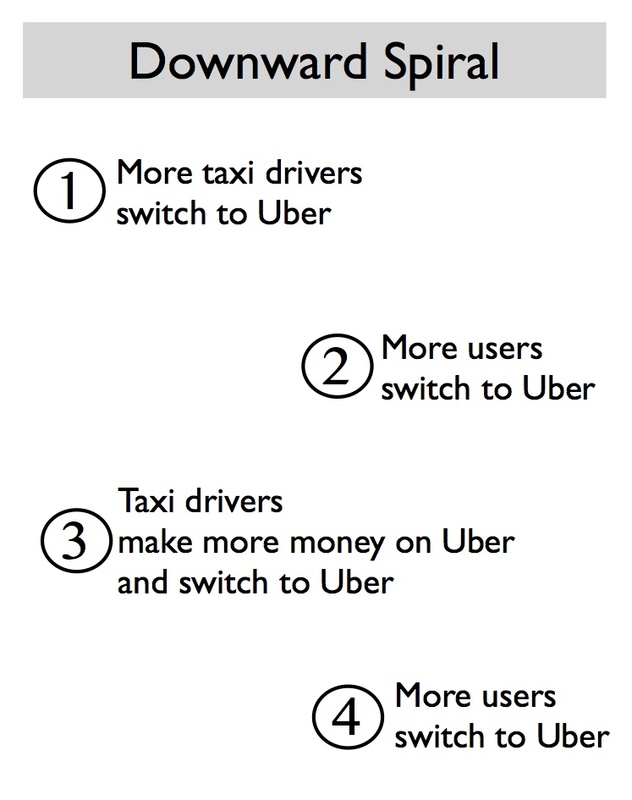 This is happening right now with Uber – more taxi drivers are switching to Uber, which means there are more cars on Uber, which means more people use Uber and fewer use taxis, which means more taxi drivers switch to Uber. 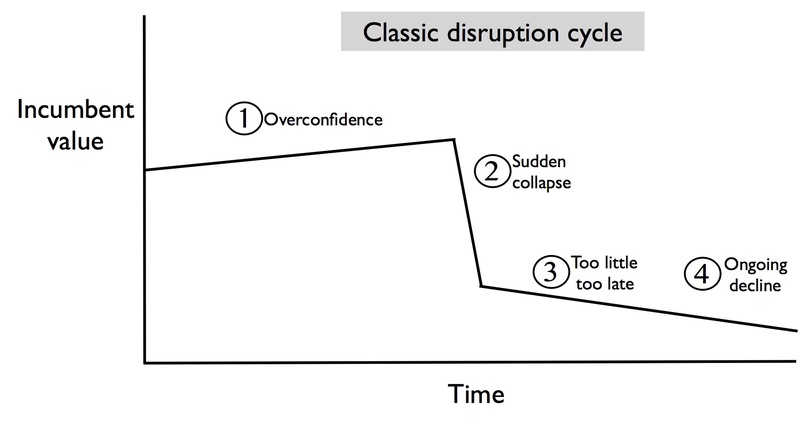 These sorts of downward spirals start off slowly (so the incumbents ignore them early on) and then hit a phase transition and shift into overdrive – often over the course of just a few months or a year. In Uber’s case it is a network effect that drives fast compounding for itself, and a rapid phase shift/cliff for the incumbents. 3. Too little too late. Incumbents try to take action but often don’t do enough quickly enough. For example, the SFMTA and cab companies in San Francisco are now adding new medallions to increase taxi numbers in San Francisco, but it is probably already game over in the long run. This and other actions (such as building their own on-demand taxi app), should have been taken a few years ago when Uber first appeared on the scene as a black car centric company. Instead, the taxi companies responded by forcing Uber to drop the word “cab” from its name and lobbied extensively on the regulatory side. 4. Ongoing decline. Incumbents may survive for many years post collapse, but are no longer really relevant (e.g. BlackBerry). Instead they suffer from ongoing layoffs and downsizing of their companies with a subset going bankrupt early. In the taxi example, the individual drivers will thrive as they move to Uber and Lyft, while the taxi companies themselves will suffer. For the next N years, people will still order Yellow Cabs and other taxis. There will just be fewer and fewer drivers and customers for these traditional services. Eventually, branded taxi companies will become an “old lady use case,” i.e. only a small subset of the most conservative prior generation of users will continue to use the dramatically downsized incumbents. BlackBerry is a good example of this. Some enterprises still buy BlackBerrys for their employees so the company has not completely disappeared. However, its relevance continues to decline as its market share slides. Old incumbents may continue to exist for years or even decades in a much reduced form after the new entrants take most of the pie. I am sure there is still a horse whip and buggy manufacturer somewhere, despite society’s shifts to automobiles decades ago.